Leverage SBI’s high-quality lentivector technology to study subcellular localization and dynamics with our line of Cyto-Tracer vectors. Easily create stable reporter cell lines with our validated, pre-built lentivectors—available as transfectable plasmids or ready-to-transduce, pre-packaged virus. 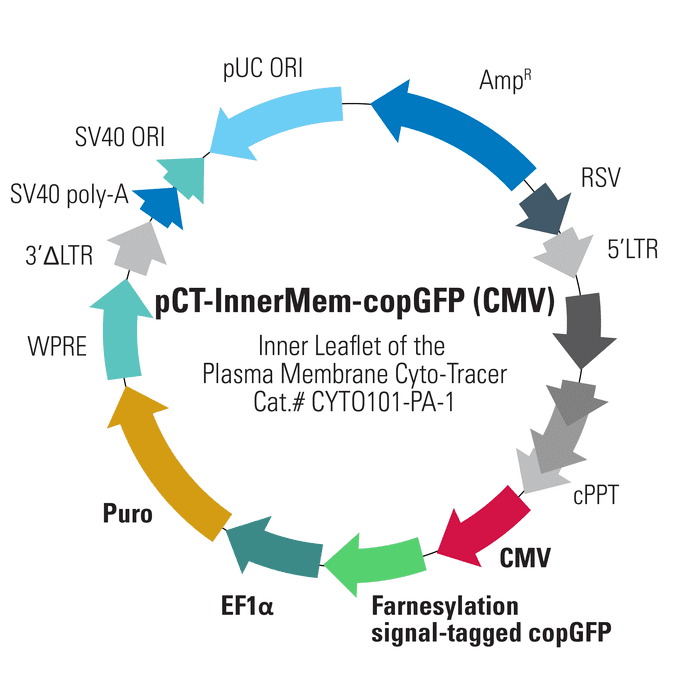 The Inner Leaflet of the Plasma Membrane Cyto-Tracer, pCT-InnerMem-GFP (CMV) fuses a farnesylation signal tag to copGFP, resulting in copGFP-labeling of the inner leaflet of the plasma membrane. The copGFP-fusion is expressed from the CMV promoter, for strong expression in common cell types such as HeLa, HEK293, and HT1080.